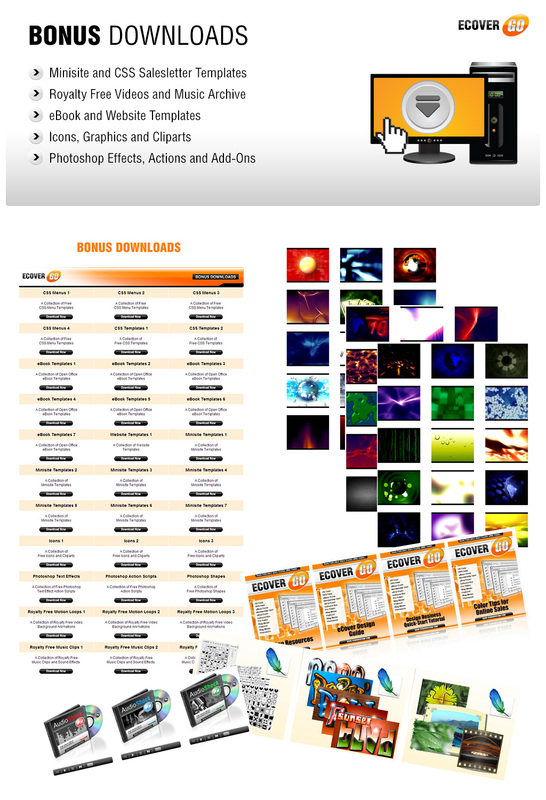 The Graphics Resources also include the Bonus Downloads, which consists of even more Minisite and CSS Salesletter Templates, as well as complete access to an extensive collection of Royalty-free videos and music archive. These can be added to your website or your clients’ websites to make the site more interactive, and to look more professional and appealing to visitors. There are many different categories of resources in this section, and it can be very rewarding to take the time to explore Bonus Downloads in detail. Bonus Downloads is specially offered to users to complement their experience on the eCover Go Site, and is only a sampling of the variety of resources that are available on the website.